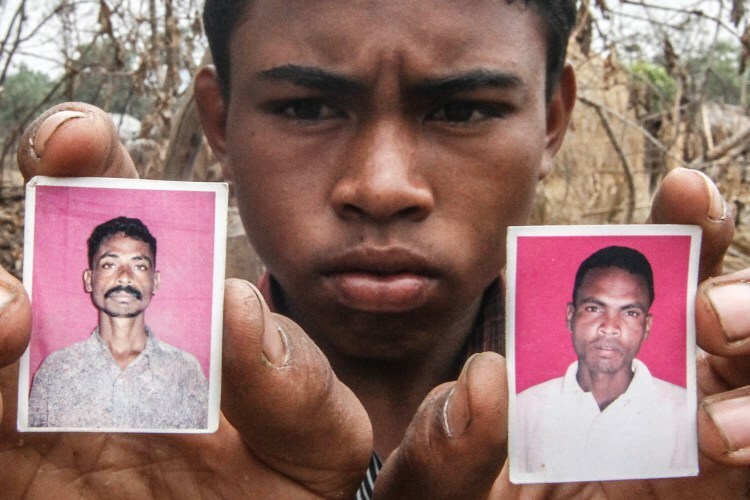 Two Koya adivasis, armed to hunt as custom demands of them, in a forest that is theirs, were automatically identified as Naxalites and shot fatally. For them, their families and friends, justice remains to be done. 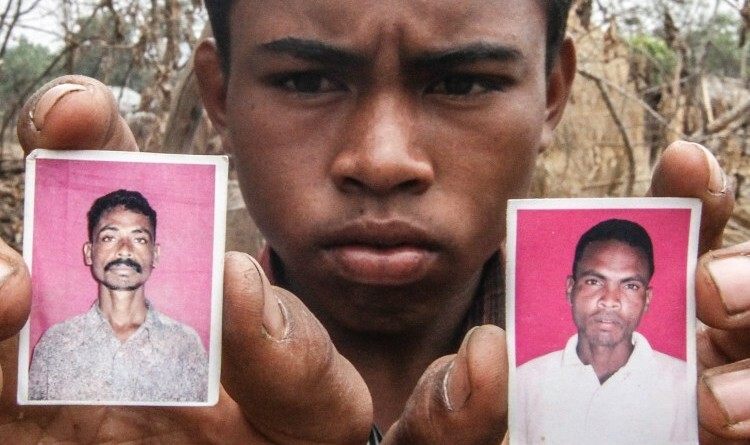 On February 21, 2016 two adivasis, who were a part of a traditional hunting party, were killed when Andhra Pradesh’s Greyhounds mistook them for Naxalites. It has been over two months since then. 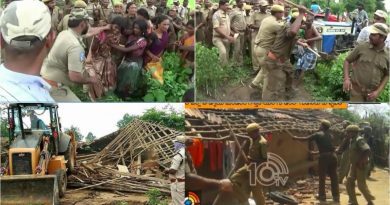 The sole survivor, 50-year-old Irma Kawaisi of Tumsapally village in Kurukonda block of Malkangiri, Odisha, wants to know why the perpetrators have not yet been punished. Kawaisi is still recovering from the two bullet wounds he received. The incident was portrayed by the police and the media as a “fifteen minute exchange of fire” with “members of Galikonda Area Committee” who were on their way “to incite locals on the bauxite mining issue”. 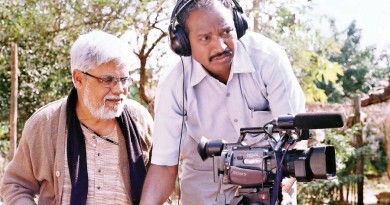 Twenty-two adivasis of the Koya tribe from the villages of Balikota, Tumsapally and Nemelguda had set out for their yearly traditional hunt, armed with bows as well as licensed homemade guns, and had ventured deep into the Puttakota forests in Vizag agency, or as they call it, “Jantamamri jungle”. They had already been in the forest for eight days, since it takes two whole days to reach Puttakota alone. Four of them, including their expert tracker Podiami Madkami, had set out alone to track a wild buffalo – when there was a burst of firing. Podiami (40) and Ganga Madkami (50) were shot repeatedly in the head and chest. Both died instantly. Kawaisi, delirious after the firing, was found by the police. They took him to a hospital, where he received treatment for his serious injuries and was released on March 16. Forty-five days later, on May 2, he is preparing to go back to the hospital to get the external fixation rod removed from his upper arm. Kawaisi remembers the first time he went on a hunt, or “veta,” with his father Joga. He was fifteen years old and had managed to kill a lupi with an arrow with the help of another hunter. Since then, he has gone on hunts every year after theWijja Pandum (seed festival) or the Aam Pandum (Mango festival). The hunters can be out in the forests for eight days or more, sometimes not encountering any of the animals they pine for: the lupi, or spotted deer, and the ghoil, or the bison, a magnificent beast that can be as heavy as 600 kilograms, as aggressive as a bear and as lethal as his hunter himself. 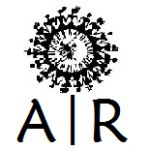 It can sometimes take over sixty people to find and kill aghoil. Regardless of whether the victory is big or small, the villagers must bring back a story of success to the village. They never hunt small animals or ones they don’t eat, like the bear. The hunting parties range from ten to a hundred people in size and hunt as ‘a combing operation,’ scattered in groups, trying to draw the animal out from their lairs and corners into a “killing zone.” Kawaisi recalls how the most memorable hunts were when more than 150 hunters would go into the forest together. On February 21, when two of his friends were shot by the Greyhounds, it was the first time Kawaisi had seen a human being die. Kawaisi had raised his hands when the firing began, yet at a mere distance of twenty feet, a Greyhound shot him twice on his upper arms, shattering the upper humerus bone in one arm and damaging the other so that it now requires a metal rod through it. 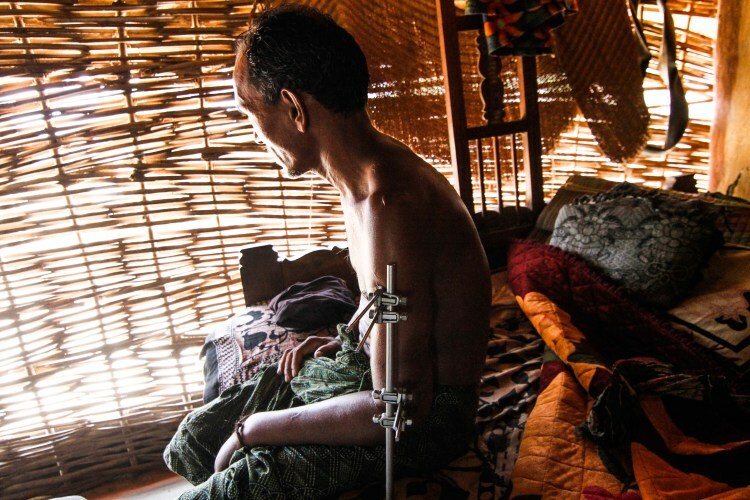 The external wounds may have healed, but the lack of physiotherapy has led to his arms becoming almost listless. Kawaisi feels pain within his bones; he has been sitting upright with his left arm attached to external fixation rods for 45 days, after all. It is noteworthy that the Andhra Pradesh police, while hushing up the matter, has been cooperating in Kawaisi’s treatment. He was given Rs. 5000 when he was initially discharged from the hospital and Rs. 10,000 when he returned to get his rods removed. The police also gave Rs. 10,000 to the family members of the deceased. The “shoot first, ask questions later, and then accuse of being Maoists” policy seems to have been slightly shaken by this case. Perhaps someone with a tinge of conscious realised the immensity of the blunder. It was two days after the firing that the villagers of Balikota knew something had gone wrong. Hadme, the wife of Podiami, remembers that something strange seemed to be going on even before she received the news: a cat kept crying and a long imli branch fell onto the roof. Eventually, the rest of the hunters from the party had returned home. The next few days were frantic. Four young men from the families of the victims were taken to identify the bodies. But the bodies were not shown to them. The police would only show them photographs of their fathers. It was five days later that the bodies finally arrived at the village. Soma, the eldest son of the deceased Ganga, recalls how his father would tell him about hunting lupis. He himself has never been on a hunt, but he was now returning with his father’s body in an ambulance from Andhra Pradesh, a journey that can take over eight hours. 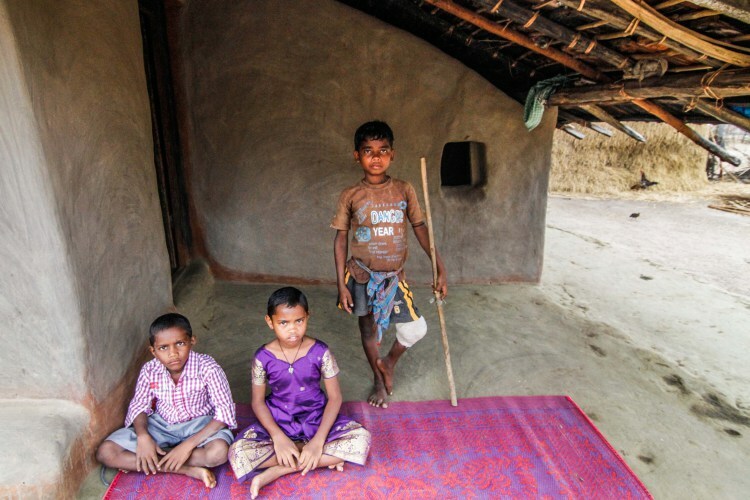 Ten-year-old Irma, Ganga’s third son, moves swiftly with a cane to support himself. His left leg is bent inwards. It is wrapped in a thick bandage upto his thigh. He is affable and curious and behaves like the man of the house. He doesn’t know why his leg is the way it is; it has been like this for over three years now and has only gotten worse by the year. When the bodies of the dead hunters were returned to the village, the villagers mourned quickly, cremated the bodies and then took Irma to a hospital in Vishakhapatnam. The fatherless boy was diagnosed with chronic osteomyelitis, an infection of the bone or bone marrow. Irma never saw his father’s body. But nobody really did, for the men had been shot in their faces. Chandan and Bijudi are the youngest of Ganga’s children. 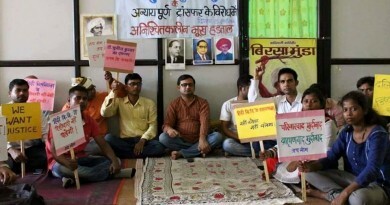 They were studying in Bhubaneshwar at the time of the killings. They were informed by the headmaster about what had happened but had refused to believe it. They demanded that their father be put on the phone. Nine adivasi children will be growing up without fathers because the state has no standard operation procedure in dealing with adivasi culture. Twenty-two adivasis, armed to hunt as custom demands of them, in a forest that belongs to them, were automatically identified as Naxalites and shot at without warning. The Human Rights Forum sent notices about the killings to the Odisha Human Rights Commission and the National Human Rights Commission on April 11. But these notices have been met with pindrop silence. The Ministry of Home Affairs doesn’t count how many innocent people the security forces kill, for such information is not meant to be recorded. But the adivasis will remember.